HomeChapter NewsAllegheny Chapter Wins Tier 2 Brick Challenge! Allegheny Chapter Wins Tier 2 Brick Challenge! Congratulations! 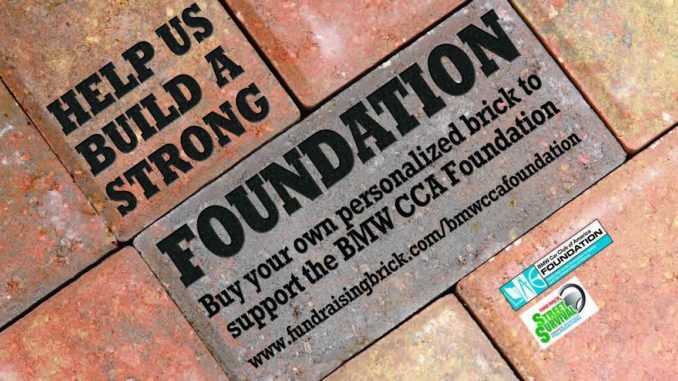 The BMW CCA Allegheny Chapter is among the winners of the Foundation’s 2016 Chapter Challenge! The fine folks of the Allegheny Chapter purchased enough brick pavers at the Foundation Museum to earn First Place ranking in Tier2! We’re so grateful for your participation in the program, and your support of your Foundation and our shared goals. Didn’t get your brick ordered in 2016? The Chapter Challenge may have ended, but the Brick Program will continue until your expanded Museum & Archive is completed. The Brick Program is an affordable way to support the establishment of your expanding Museum & Archive, and the Foundation’s continuation of the Street Survival teen driving program. Bricks start at just $50. You can choose among BMW silhouettes, add your chapter logo, or other BMW CCA-related designs to convey your personal message. And our online webpage allows you to virtually design your brick and see what it will look like once engraved. How cool is that?! Thanks to your entire Chapter for your support of this program, and your CCA Foundation!